We have certified & well trained Oral & Maxillofacia surgeon in Lahore. Our Maxillofacial surgeon is trained in Pakistan as well as the UK and Iran. Our services include treatment for whole range of Maxillofacial Trauma (Facial Fracture), Orthognathic Surgery (Jaw Deformity), Oral and Maxillofacial Pathology (Any abnormal swelling, ulcer, Lump) Oral Cancer, Temporomandibualr Joint Problems, Facial Cosmetics specifically Rhinoplasty, Lip augmentation and correction of wrinkles etc. Minor Oral Surgery (Dental Implants, wisdom tooth extractions, cleft lip and palate in children). We are trained in giving our patients the best treatment. We carry out all surgical procedures painlessly. We offer our patients extraction and placement of dental implants at the same time without any pain and discomfort. We offer extraction under sedation for fearful patients. A certified surgeon in maxillofacial surgery, trained to extract teeth without causing any pain and discomfort under local anesthesia and sedation. Extraction is the removal of a tooth from the socket in the alveolar bone. Performed for a wide variety of reasons like impacted wisdom tooth causing pain & infection. Equipped with the latest technology to provide best solution in OMFS. Treating diseases, injuries, fractures, defects in the head & neck, face and jaws with the latest equipment. In case of any emergency: we have our doctor on call to help 24/7. Our staff is highly trained to face any type of urgent situation in our clinic. You are in safe hands. The most common reason for extracting a tooth is tooth damage such as breakage or fracture. Some other possible reasons for tooth extraction are as follows: Extracting it when it is blocking the other one. Severe gum disease may affect the supporting tissues and bone structures. Severe tooth decay or infection In preparation for orthodontic treatment (braces) In preparation for orthognathic surgery Insufficient space and severe pain caused by wisdom teeth (impacted wisdom tooth) Receiving radiation to the head and neck may require extraction in the field of radiation. These are performed on teeth that are visible in the mouth, usually under local anesthetics, and require only the use of instruments to elevate and/or grasp the visible portion of the tooth. Typically the tooth is lifted using an elevator, and subsequently using dental forceps, rocked back and forth until the periodontal ligament has been sufficiently broken and the supporting alveolar bone has been adequately widened to make the tooth loose enough to be removed. Surgical extractions involve removal of a tooth that cannot be easily accessed, either because it has broken under the gum line, lying in unusual position, has curved roots and not visible in the mouth. 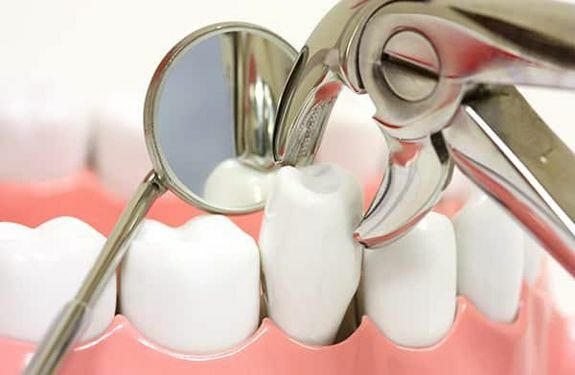 In a surgical extraction, the doctor may elevate the soft tissues covering the tooth and bone and may also remove some of the overlying and or surrounding bone tissue with a drill. Frequently, the tooth may be split into multiple pieces to facilitate its removal. By taking an x-ray and examining your tooth, the dentist can usually determine whether or not your extraction will be simple or surgical. But there are times when a simple extraction turns into a surgical one. If a tooth breaks off during the procedure, for instance, it may need to be taken out in pieces. Wisdom teeth often face surgical extraction because they’re usually impacted, meaning they are not completely erupted or visible into the mouth. This condition requires cutting through bone and tissue. Removing severely broken down teeth, root tips or long-curved roots are other examples of surgical extractions. Then there are times when the bone around a tooth has become dense, resulting in the need for surgical treatment. With surgical extractions or any minor surgical procedure in the mouth, you’ll most likely have one or more stitches at the extraction / surgical site. Regardless of it, whether your extraction is simple or surgical, it’s always important to closely follow your dentist’s after-care instructions to speed up recovery and avoid any complications. The underlying post-extraction instructions should be followed: Bite down on a gauze pad for 30 minutes after the extraction to help stop the bleeding Avoid unnecessary talking, eating and drinking for the first two hours after extraction Drink plenty of cold liquids after the bleeding subsides. Maintain your diet, but start with clear liquids and soft foods for the first day. Don’t rinse or brush your teeth for 12 hours. Avoid the surgical area when brushing, although you can gently rinse with a diluted mouthwash or 1/4 teaspoon of table salt in a glass of lukewarm water. Don’t use straws, smoke or spit forcefully as long as there is bleeding. Follow our instructions on using any prescribed pain medications. TMJ is a hinge that connects your lower jaw to the temporal bones of your skull, which are in front of ear. It lets you move your jaw up and down and side to side, so you can talk, chew, and yawn. Problems with your jaw and the muscles in your face that control it's movement are known as temporomandibular disorders (TMD). Grinding or clenching your tooth, which puts a lot of pressure on the joint. Stress, which can cause you to tighten facial and jaw muscles or clench the teeth TMD often causes severe pain and discomfort. It can be temporary or last many years. It might affect one or both sides of your face. It’s most common in females and among people between the ages of 20 and 40. Pain or tenderness in your jaw joint area, neck and shoulders, and around the ear when you chew, speak, or open your mouth wide. Problems when you try to open your mouth wide. Jaws that get “stuck” or “lock”. Clicking, popping, or grating sounds in the jaw joint when you open or close your mouth or chew. This may or may not be painful. A tired feeling on your face, Trouble chewing or a sudden uncomfortable bite – as if the upper and lower teeth are not fitting together properly. Swelling on the side of your face. Reduced mouth opening and difficulty in falling asleep. You may also have toothaches, headaches, neck aches, dizziness, earaches, hearing problems, upper shoulder pain, and ringing in the ears (tinnitus). Our dentist will take details of your problem from you and check your jaw joints for pain or tenderness and listen for clicks, pops, or grating sounds when you move them. He will also make sure your jaw works like it should and doesn’t lock when you open or close your mouth. Plus, he’ll test your bite and check for problems with your facial muscles. We may take full face X-rays to view the exact situation. The MRI can also be a way to diagnose. Also, a CT scan shows the bony detail of the joint. Our dentists can prescribe higher doses of NSAIDs if you need them for pain and swelling. We might suggest a muscle relaxer to relax your jaw if you grind or clench your teeth. Or an anti-anxiety medication to relieve stress. Highly qualified dentists are here to provide best treatment and give you a pleasant experience.